This morning, compost piles are riding high with pumpkins from last night’s celebration of Halloween, a holiday that in years past was treated warily by Christians but has more recently been allowed back onto the calendar by many. Why did we salvage it? I’m guessing because we recognized the sheer joy of it for our children, and that for many of us it was the only time all year we interacted meaningfully with our neighbors. Gone are the days when you could tell the house of the devout Christian on the block by the darkened windows and candy-less bowl of tracts on the porch. And I admit I’m glad. But there’s a new holiday villain “comin’ to town”, and his name is Santa. If “good Christian parenting” of the 80’s and 90’s was marked by snubbing all things Halloween, it now appears to be marked by a wariness toward the Jolly Old Elf himself. I know this because of the frequency with which Jeff and I are asked "What did you do about Santa?" In the minds of many conscientious Christian parents, Santa now rubs shoulders with other shady characters like Harry Potter, the Tooth Fairy, and Ariel the feminist shell-wearing Disney princess. And why not target Santa for hostility? After all, (spoiler alert) he isn’t real. Sure, he’s a historical figure, but the fat-white-guy-in-the-red-suit-who-sneaks-into-homes-to-leave-presents-for-kids-who-have-earned-them-by-good-behavior is not just a myth, he’s a creepy myth. Good Christian parents don’t lie to their children, especially not about works-based, anti-gospel, diet-dodging, voyeuristic Santa. Ask anybody in the Bible Belt. So, here’s where I confess: The Wilkins kept Santa as part of Christmas. And we loved it. Loved it, loved it, loved it. And we’d do it the same way all over again if we could. Stay with me. I can explain. Jeff and I walked into parenting without a plan for Santa (I guess his heretical status had not yet been firmly established in 1996). 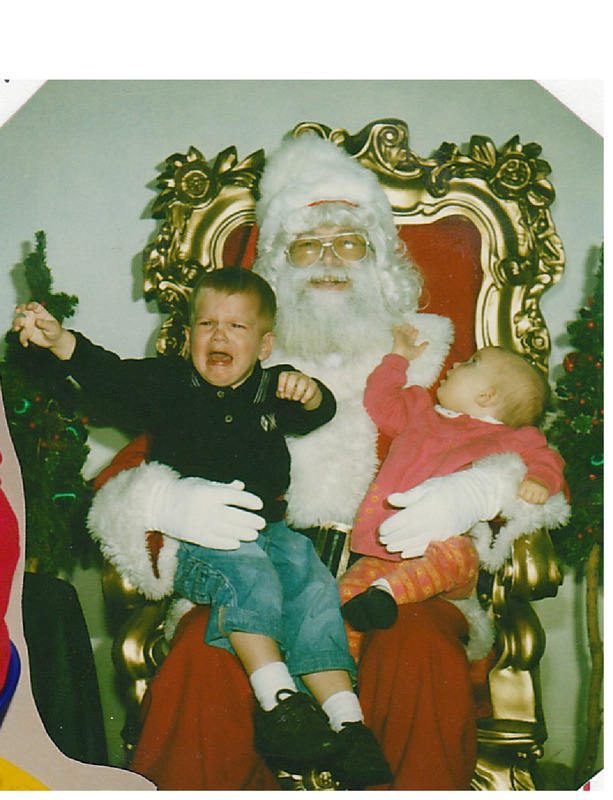 We both had fond memories of Santa from childhood. As adults, we knew there were parts of Santa we liked and parts we didn’t like, so we improvised, keeping what we liked and ditching what we didn’t. We gave him a cultural place in our family’s holiday traditions without allowing him to undermine the message of the Advent story. So I offer for your consideration our approach to Santa, in case you, too, harbor a secret sadness at seeing the Jolly Elf vanish from the Christmas landscape. We waited for Santa to show up. We didn’t start the topic – we waited until our oldest child introduced it, and then we responded as briefly as possible to questions and comments. We stacked the deck. Once Santa was on the radar, we told the kids “There’s a secret to Santa. If you think you have figured out the secret of Santa, come ask Mom and Dad.” For awhile, the kids would come to us thinking the secret was that Santa used the front door instead of the chimney, or that the reindeer didn’t really fly. We would respond “That’s not the secret of Santa, but keep thinking!” When they figured out that the secret was that we were Santa, they thought it was hilarious: “All this time it was YOU filling our stockings!” They knew they had not been tricked or lied to, but that their mom and dad had planned a fun surprise for them to discover. We limited Santa’s clout. Santa only brought stocking presents. We wanted the kids to thank Mom and Dad for the big stuff. We didn’t give Santa center stage. Our Christmas tradition centered (and still centers) heavily around the nightly reading of an Advent Book that told clearly the story of the birth of Christ. It is by far the kids' most meaningful Christmas tradition at our house, and they can recite the Christmas story by heart because of it. We happily edited Santa to match the reality of who he is (mom and dad). When a child asked “Does Santa really not come if you’re bad?” we’d answer with “Well, what do you think about that? Does that sound like Santa?” They were more than eager to alter their view of Santa to that of a gracious giver instead of a meritorious one. You might be thinking, “Okay, so you found a way to keep Santa, but why bother? Why not just tell your children he’s not real and move on?” We had a couple of reasons for not doing this. First, we supported a child’s natural right to possess a huge and wonderful imagination. Research shows that about 65 percent of all children develop imaginary friends between the ages of three and five. Most Christian parents would not put an end to an imaginary friend – they would wait for the child’s imagination to outgrow the friend. And we would not accuse those parents of lying to their child. Santa is not an imaginary friend, but he appeals to the same place in a young child’s imagination, much like a Disney princess or a character in a book. The line between reality and fantasy is blurry for little children, as is their developmental right. They outgrow their capacity for fantasy as they mature emotionally. We were willing to let that process take its natural course with Santa, remaining cautious not to do anything to reinforce or prolong the fantasy. Second, we didn’t want to ask our four-year-old to be an apologist for an adult view of Santa. In other words, we didn’t want to send him into preschool having to conceal from (or reveal to) his friends the terrible secret that Santa was a fraud. By giving him the chance to figure out the secret of Santa on his own, we bought him some anxiety-free time with his peers in which he could share their excitement over Santa without having been deceived by a parent. All of our four children figured out the secret of Santa by about age six. By that age, keeping the secret from peers was far more within their powers of self-control than if we had laid the burden on them from the beginning. Rest assured Santa will be culturally imposed on your family: he will be on the radio, on the TV, and at the mall for a photo op. Whether or not he overshadows the gospel message of Advent is up to you. If that message is only talked about in your home during the Christmas season, you should definitely loathe St. Nick. But parents who impress their children with the gospel message year round have little to fear that Santa will compromise their worldview. In reality, December is only one of the twelve months in which our children are assaulted with anti-gospel, materialistic messages. We would be remiss to make Santa the December scapegoat for a negative message we have neglected to address from January to November. Can Santa be harmful? Absolutely. Our children reported adamant Santa-belief among their peers well into the fifth grade. It takes a firm commitment to deception on the part of a parent to prolong a child’s belief in Santa to age eleven. And that’s not okay. But at the Wilkin house, we remember Santa fondly. In fact, he still fills the stockings each year. Keeping Santa on our own terms, deliberately making him an extension of ourselves as parents, a minor figure in the holiday celebration, and a clever riddle to be solved allowed us to preserve a fun childhood memory of our own and to hand it down to our children. Not surprisingly, Wilkin-Santa looks a little familiar if you take time to notice: he gives freely without asking for anything in return, and he reveals himself to those who earnestly seek him. And Someone like that will always be welcome in our home. I love this. Thank you so much! My sweet little one is 9 months old and we'll be celebrating his first Christmas this year. My husband and I have wanted to keep Santa as part of our traditions, but just struggled to say it was okay (after all, rearrange the letters in Santa and what do you get?). We both grew up in Christian families that enjoyed the Santa tradition, and would love to continue the fun! this is great - you've articulated what i think about santa, but never could put into the right words. thank you! I've been an anti-Santa parent for all of the reasons you mentioned (don't want to lie to my kids, don't like the God-like nature of Santa, etc. ), but I like the way you've approached it. I think we'll be doing something like this at my house from now on. Tyler & I are trying to decide what traditions we want in our home now that we have Luke here:) I love the approach you and Jeff took, so glad you were able to "keep" santa and still not lose the real message of what Christmas is and means! What do you mean by "We waited for Santa to show up." Does that mean you didn't even put Santa in your Christmas until your oldest asked why he wasn't a part of your Christmas? Could you expound? Thanks! Good question...Santa was around - in decorations, in songs, at the mall, in Christmas cards - what I meant was that we didn't make a point of discussing him with the kids until the kids wanted to discuss him. Basically, we didn't introduce him "formally" into the holiday tradition until our oldest child became aware of him. Then we set the expectation that Santa brought stocking gifts on Christmas Eve (this was probably around age 3). Great post Jen. Thank you for sharing. This topic has come up many times now that more of our friends are having children and we're praying that God adds kids to our family. I was just curious if your kids ever just out-right asked "Is Santa real?" and how you responded. Do you tell them the whole truth or continue to encourage them to find out the "secret" to Santa on their own? Hi Angela, if they asked outright "Is Santa real?" we said "What do you think? It sounds like you're not far from figuring out the secret of Santa." The realization we were looking for was "Mom and Dad are Santa!" Strictly speaking, Santa is real - he's us - so we would give encouragement for them to think just a little further. That question usually appears for one of two reasons: because the child knows the secret of Santa or because another child has told them Santa is not real. In the first case, the child would probably immediately reach the right conclusion. In the second, they may decide to think a bit longer before figuring out the secret. Either way, as in many other parenting situations, we wanted to train them to think things through on their own as much as possible. Jen - I got so much out of this post. Thank you for writing it! Fantastic post. Thank you for sharing! My husband and I do not have children yet but are definitely talking about this subject. You bring a gospel perspective with keeping the silly, fun parts of the holiday. Thank you! This is great, I have been really having conviction of what we should do for this... I knew lying to my kids was not an option, but this sounds great. Thank you so much for sharing your God given wisdom to other parents. Love your blog and loved your parenting classes! Thank you so much! This year Jake is 2 and is asking away. We were going to tell him the truth but it just didn't feel right... I felt like I was denying him the joy of wonder and forcing him to be older than he is!!! What a great compromise. Love The Village Church. Disappointed in this representation from it. Lying to your children by calling it a "secret" in order to embrace and preserve this worldly figure is, at the core, plain old cultural synergism. Stand firm for the Gospel over everything. There is no compromise for a follower of Jesus. Luke 10:27, Joshua 24:14-15.
csc, read the last paragraph. I loved this post and if/when God blesses me with children I will keep this light-hearted tradition alive. I love that you keep Christmas Christ centered (is there any other way??) :) Thanks for the ideas! I love, love, love this! I have posted it to facebook as well as pinterest because I LOVE it! The only exception I take to it is the statement, "It takes a firm commitment to deception on the part of a parent to prolong a child’s belief in Santa to age eleven. And that’s not okay." Some children are just believers....and love to hold on to the magic even when they have doubts. I teach 5th grade Sunday School and I have at least 3 girls who still believe.....even though their parents are giving them hints left right!!! (The parents feel that it is time....) So, I'm not sure about the strong commitment to deception. But---I LOVE, LOVE the rest--and will be using every bit of it in my home with my two imaginative children! Thanks!! Someone sent me this after my blog post yesterday, and it totally settles right with my heart. I admit to being one of the few who was on the fence about what to do with Santa, and yet I loathe the idea of shutting off lights, and not using Halloween to love on your neighbors, what would have been different. Thank you for opening my eyes to that. So thank you. I love the magic that comes with the holiday, but didn't like the deception part, excited to tell my kids, that there is a secret to santa. I love the way you approached this! I'm wondering - clearly you got photos of your kids with Santa right? Did you do this when the oldest was young too, before Santa was brought up? And how did you explain going to see the mall Santa? Hi Ashleigh, the photo I posted is my oldest and second oldest in a grandparent-initiated (but not unwelcome) photo with Mall Santa. Mall Santa is a big hit with grandparents. :) Kids get suspicious about him quickly. When they asked if he was really Santa we responded with "Good question, what do you think?" Our kids reasoned, with some gentle guidance, that he couldn't possibly be the real Santa but that he was a fun photo op. And that's true. What a great way to approach The Great Santa Debate! Thanks! My kids are 5 and 3 and are WAY too into santa. I've never liked the idea but wasn't able to think up something this clever! My question is NOW what do I do?? How do I introduce your approach (which I LOVE) after 5 years? Recently, my 5 year old asked "is santa real?" I panicked and said "of course" UGH! wasn't thinking on my feet that day! Any suggestions would be appreciated. I want to start your tradition ASAP!! Jenn, sweet girl, deep cleansing breaths...you are still on safe ground. Santa is absolutely real - Santa is mom and dad. Let's get you on your way to guilt-free enjoyment of your Christmas traditions. You might want to circle back around to your five-year-old at a suitable moment (probably not Christmas Eve :)) and say "Remember when I told you Santa was real? Santa IS real, but there is a secret to Santa. Think hard, and if you think you figure out the secret, come and ask me." Other than that, just do your best to spend twelve months of the year celebrating Christ, and Santa will just be a fun part of your Christmas tradition. I'm rooting for you! I love this. I LOVE this! You've eloquently explained how I've viewed Santa from the start, even though I've not known how to explain my thoughts about the Santa dilemma. Thank you for making the Santa boundaries a little clearer for me with purpose and reason. In our home, our kids know that Santa takes a major backseat to Jesus, but I haven't been able to clearly explain to others why we just don't give Santa the boot. My kids are 8,6,3 and 1 and the oldest still believes, although I see the doubt creeping in. In fact, we think she's milking it. Ha! Now I almost can't wait for her to learn "the secret." What a relief! I can't wait to point my friends toward this post! Merry Christmas to you! I have truly been blessed by your blog and the teachings I have found through Village Church. I have gone through the parenting one and now the Sermon on the Mount. Love them all. Thank you. I have a bigger issue at Christmastime... my husband (professes to be a Christian) refuses to celebrate it at all due to the pagan roots and how God wants us to not mess with anything pagan and make up ways to worship Him (in a nutshell). Same with Easter and Halloween. For the past 2 years we have spent them as normal days. (By the way, my kids are 3, 2 & 1 and have no idea what is going on anyway, yet.) I was wondering if you or anyone at the Village Church has ever tackled this topic. It is extremely straining on our family at this time. I am sorry to drop this on you and your readers, but I was only hoping for a possible lead to information if you had one. Thank you, thank you, thank you. Many blessings to you & your wonderful family that I feel I have sort of met. Thank you for sharing with us all. Blessings from Alabama! Thanks for your sweet words! I’m so glad you’ve found the blogs and studies helpful. If you ever want to contact me directly, you can use the email address on the blog: jenwilkin.blog@gmail.com. It is hard for me to understand all the Santa support from so many Christians. Or the joy from more people accepting Halloween. To me, they are more evidence that satan just keeps pulling the wool over our eyes. As long as he can keep us from focusing on Jesus, he is thrilled. Have any of you ever wondered what Halloween and Santa are really all about? No matter how you try to sugar coat it, they have satanic backgrounds. You should check out blowthetrumpet.org, or just google it. There are many traditions that can be traced for hundreds of years, but does that mean that they are correct just because so many others do them? If you truly sat with an open heart and took these "traditions" up against scripture, I don't believe Halloween or Santa would have a leg to stand on. It truly saddens me how many Christians allow such worldly "traditions" be passed down for so many generations. We are suppose to be the salt and light of the world, not blend in with it. You have certainly challenged me this morning. It’s always a good sign when I initially disagree but know I should give a full, fair hearing…I’m probably about to learn something (and I did)! I appreciate your approach to Santa on many levels. First, it seems you don’t lie or deceive your children (not sure how the ‘Santa only brings stocking presents’ idea came to be or what to make of that). I appreciate allowing your children to unravel this puzzle for themselves in light of evidence under the guidance of trusted parents. Your creativity is great too…I never considered this “secret to Santa”approach (my son is only 10-months old) and I do like it. This has added a great deal to my thinking for the future. Thank you so much for your care and thoughtfulness toward what I consider an important issue. Here are a few thoughts for consideration and dialogue. First, is it possible to afford your children the right to a big and wonderful imagination apart from Santa? I am the first to get in line for story-telling and pretend games with kids to encourage imagination. I would argue Santa holds a different place in our culture than other fictional stories and figures. Children don’t write letters to and sit on the laps of and sings songs about other pretend characters; these things instill reality. Santa has been invited into our homes and lives by Mom, Dad and the culture, not the children, even in “waiting for him to show up”…children didn’t create him. As you pointed out, children have a hard time discerning reality and fantasy. Santa is presented as reality whereas other scenarios (cowboys and Indians, dressing up as princesses) are understood as pretend. Could this have a more significant impact than we are assigning? Further, does it hinder children’s understanding of Jesus, someone who in the eyes of a child is less real than Santa and is highlighted during the same season? I hope I have interacted well with your post and offered a respectful perspective. I sincerely respect what your family has chosen and I have gained from it. If I’ve misread you I apologize. I’m truly interested in your response. I did not intend for it to be this long! Thanks in advance for your grace and interaction, provided you have the time. If you'll email me at jenwilkin.blog@gmail.com I'll send you what I wrote. Thank you Jen...I can't believe mine wasn't over the character limit! I love your response, Emily. It's exactly what I was thinking. We don't "do" Santa, in fact, I'm very anti-santa. This post didn't change my mind at all, as our goal is to keep Christmas about Christ and even with the alterations Jen suggested, I feel it would distract from Him. We don't do Santa decorations at our house, but we do allow Santa movies - we just let the kids know that he's just like Dora. Good for TV and make believe, but not real. We tell them about St. Nicolas and how he was the original Santa. A friend of ours celebrates St. Nicolas day with her kids (December 6th I think) where they take a wagon load of gifts and doorbell ditch it at another families house. But if we're celebrating Christ's birth on Christmas, we need to keep it about Christ. I know God works in all of our hearts differently, so I've never judged anyone who includes Santa in their celebration, I just know that it's not right for us. I'm a little sad now (and have been the last few years) because I had no clue this compromise could be made...8 years too late. I've been trying to figure out a way to do the 'Elf on the Shelf' game to bring in some fun. My kids know he's not real, but a game we play for Grammy...I also have such a hard time making sure that we get to our daily Bible Studies & daily time with God. In all honesty I have to be very careful to not focus on all I'm doing wrong....thanks for thisb awesome post. I'm passing it on to myb sister!! Thank you for sharing this. I have struggled the past couple of years on how to approach this with my young children. These are great, practical tips. Thanks again! Very persuasive. Look how many people you've given the green light to "compromise" their beliefs. Notice how many posters mentioned in some way that they have been struggling with how to handle Santa? Because they know they shouldn't include him, but you've just made it ok for them to do so. I, too, am very disappointed that this is the message coming out of The Village Church about Santa. Children are able to have incredibly vivid imaginations from January to November. How does one month permanently stagnate their ability to fantasize? You said you didn't want your young children to have the adult burden of keeping the secret from other children, but your kids were six when they figured it out. So based on your theory, they can handle the burden at 6, 7, 8, 9, 10 but not at 3, 4, and 5? I don't follow this line of thinking as children are much more verbal, social, and cognitively developed at the age of 6 than they are at the age of 3. One poster said it best when she wrote, "What a great compromise!" Hi Erin, thanks for your response. I cannot apologize for offering an alternative view on an issue that is a matter of conscience. I think the absence of dialogue on matters of conscience would be harmful to the health of the church. All matters of conscience require struggle. For example, Christians struggle with how to educate their children, they consult different viewpoints, they arrive at a solution that works for their family, and (hopefully) they extend grace to those who have chosen differently. As to your second point, I did not say that a child's ability to fantasize would be "permanently stagnated" without Santa. I just pointed out that Santa doesn't necessarily have any more power over a child than any other imaginary character. Third, I agree with your statement "children are much more verbal, social, and cognitively developed at the age of 6 than they are at the age of 3". Yes, a six-year-old is better equipped to know and not tell peers that Santa is mom and dad than a 3-year-old is. That was the point I wanted to make. I'm not sure where we are in disagreement here. Oh my gosh this is AWESOME! Well written and thoughtful. I'm so doing this in my house. I have an almost 3-year-old and an almost 5-year-old. In years past we haven't had to be super intentional about what we do with Santa. We've done things very similarly to what you've written about, and just been honest when our oldest asks where his toys come from (didn't think of the "secret of Santa" verbiage. But this year we were talking about Operation Christmas Child and getting to buy gifts for kids who wouldn't be getting anything for Christmas, and my son said "Oh Mom, don't worry. They'll get presents. Santa makes them and delivers them to everyone." I'd love to know your thoughts on how you would handle that comment - it was very convicting to me that he was spouting it off as truth and I feel like it can't go unaddressed, but at the same time, he's not even 5. This is a really great question. So, it's not true that Santa brings everyone presents, and you don't want to perpetuate the idea that it is. If it was a passing comment, I don't think you necessarily need to re-inrtoduce the topic. But if it comes up again, you might say, "Honey, these are kids who need things all year long. Jesus said that when we see someone in need, we should help them. So, maybe Santa will bring them gifts, but this is a chance for us to be like Jesus by giving them gifts." If he presses the idea that Santa will bring them gifts, it may be time to tell him the secret of Santa. Fantastic advice. Thanks so much for sharing! Thank you! I grew up in a Christian household that didn't do Santa because my parents didn't want to lie to me. I feel like I totally missed out. No joke, to this day I am so sad that I don't have those anxious excited memories that my husband has. I knew when I had kids we would absolutely be doing Santa. My son is three this year, it's the first time he kinda gets the whole Santa thing. Your article has really helped me figure out a way to make this work for my family. Love this article. I grew up in a strong Catholic household knowing exactly what Christmas was really about, but also grew up with Santa as the giver of a gift or two during my childhood. Funny enough my parents never indulged on the idea of Santa and how he did things. I think there is absolutely nothing wrong with children using their imagination without filling their heads with unnecessary lies. I loved my childhood memories of Santa but also loved Christmas Eve Mass and seeing the Live Nativity Scene. How about the real truth about Santa Claus? A child who's old enough to understand simple church history could be introduced to Saint Nicholas and who he was and what he did. Follow this with a brief summary of how this image has been subverted by advertising agencies and pop culture into the current edition. I know some of this is teaching from traditions with which western evangelicals aren't as familiar. But it's worth looking at. Wow! I don't have children, but when I do I think "my" Santa Claus will look a lot like yours does. We are not a Santa family and it can be a tough thing to navigate! I didn't realize it is a current trend as I did not grow up with Santa either but I know way more people who "do" Santa than that don't. In fact I wonder when Santa even entered the cultural picture as he is in our culture today. I have an awesome journal entry written by my great grandmother about "a Christmas long ago" and it was a much simpler time and certainly no word of the jolly bearded man is to be found in her handwritten pages. Jen, could you please suggest a gospel-centered Advent book? Some of the ones I've seen lean heavily on family traditions, but I would prefer one that centers around the history and Gospel of the Christ. Thanks for your perspective! Just discovered posts, such as this one. So very encouraged by the display of purposeful parenting represented in each comment!! As a mom of elementary, middle and high school girls; I can not believe that I can not believe they are already so old! Know there is a pretty good chance I wouldn't have taken heed to this admonition when I was in the throws of babies and toddlers; but, feel compelled to comment anyway. Run fast after Jesus. Accept the weight associated with the great privilege of being entrusted to raise this tiny human (who will one day have a spouse & children of their own...and on...and on...). Proactively protect your marriage and/or yourself as a person. Be an ambassador of grace (to yourself & others). Seek & offer support, Purposefully parent. And ENJOY these~all/even these~small moments! Trust me....they actually do go so very fast!